I would always prefer spending time creating content than being on social media. I view it as a necessary evil – it’s great for connections and knowledge but you don’t want to get sucked in to the cat pictures. I’m staggered to find that I’ve been on Twitter for four and a half years and have tweeted some 15,000 tweets. I’m staggered, not only because it seems like yesterday when Twitter exploded onto the scene, but also because I consider myself as a novice at it – I remember plenty of my blogger friends were on it ages before me. I have over 2,300 people following me on Twitter. Not a high number by any means, but my tweets do get seen and retweeted from time to time. And, in order to capitalise on this, I’m doing some automated bulk tweeting. I’ve been using Hootsuite‘s Hootlet to schedule individual tweets for quite a while, so I decided to go PRO and try out their bulk scheduler. The column which takes a bit of time to create is the Date column. 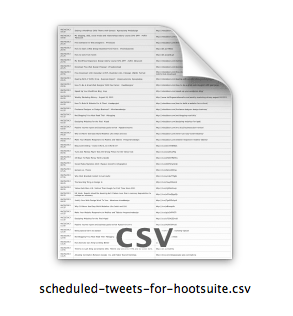 Click on the above icon to download the sample scheduled tweets for Hootsuite CSV that was used in the above video. 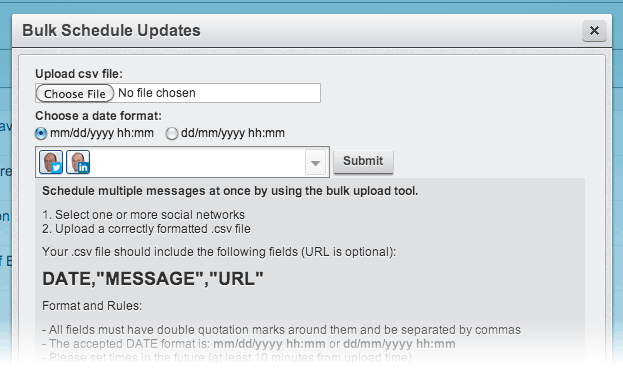 Hootsuite says “all fields must have double quotation marks around them and be separated by commas” but this is not necessary if your CSV was saved as a spreadsheet in Excel. Remember you can do this for Twitter, LinkedIn and Facebook updates. If you don’t want to go PRO on Hootsuite you can schedule tweets manually with their Hootlet which is available as a Firefox and Chrome extension. Above is another video which shows you how to do this. I’ll continue to schedule tweets and other updates like this for now and see how I get on. 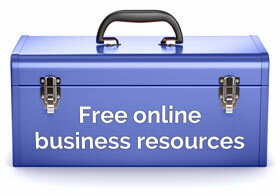 Would you be interested in this service from Hootsuite? Or do you think bulk messaging is too automated and therefore not “personal” enough for social media? One thing’s for sure, Hootsuite, having provided a great free service, is reaping the benefit and will receive my money for the upgraded social media tools. The “freemium” model works everytime! Damn, what an awesome tool and way to use it in! Interesting Rob. I’d love to know how this works out long term. I’m not much of a fan of social media and the automated stuff on Twitter really turn me off it. Yet, I think how you are using this seems fine given what you have here, the time zones and how older content often gets lost. Thanks for the video – I suspect sometime in the future I may need it. Hey David, I know what you mean. 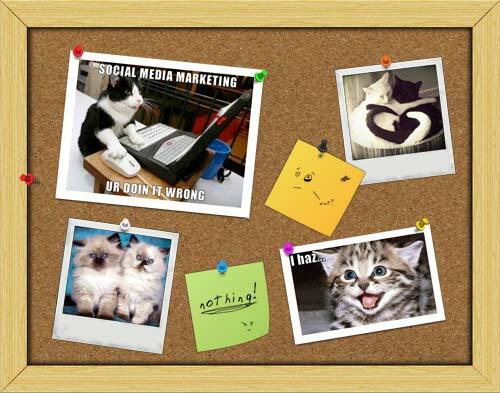 I’m still not sure about the real advantages and disadvantages of mass social media posting. 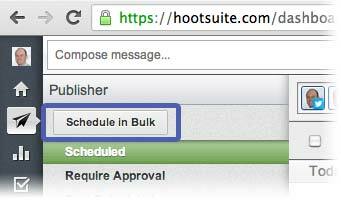 I’ve got a 15 minute call with Hootsuite later in the week which I’m looking forward to. Anyway, I’ll see how it goes for the next few weeks. Thanks. I’ve been using the free version of Hootsuite for a while now and I find it very convenient. If I had the time to post more blog posts and have built up a good number of them as you have Rob, then I would definitely consider paying for bulk upload. Social media is fine in small doses. I would find it more appealing if I didn’t see status reports as ‘Just going to the loo’ and yes, the dreaded cat pictures [cringes]. Google is putting a lot of emphasis on social media and how it links to your website which is really the only reason I use it. Thank you, Lee. Well, I’ll see how it goes for the next few weeks. At the moment it’s working quite well. Yes, I share your reservations with social media but I can’t deny that I’ve discovered some great people and great knowledge through social media that I wouldn’t have otherwise. And, yes, it’s also important SEO-wise. In Denmark, twitter is not widely used and I use it only for SEO (indexing of new posts). I have difficulty st see the purpose of the program. Is intended only to get a twitter account to see active out? With planned tweets, it will of course only be stale tweets and who wants to read them? Twitter is the one social platform where you can re-post the same message many times without annoying people, Jonas. The nature of these shorts posts (140 character Tweets) is that nobody ever goes through one person’s Twitter profile hour after hour. They occasionally dip in to several people’s tweets at various times during the day. So the chances of your followers seeing that you’ve repeated something is very slim. This tool can also schedule posts to Facebook and LinkedIn – I find that quite useful.